We're training communities across the country on best practices for serving lesbian, gay, bisexual, transgender, queer, and questioning youth experiencing homelessness. When service providers are inclusive and affirming of lesbian, gay, bisexual, transgender, queer, and questioning (LGBTQ) youth, young people are more likely to get the support they need. According to a study by Chapin Hall at the University of Chicago, LGBTQ youth are 120% more likely to experience homelessness than non-LGBTQ youth. Our own research shows that LGBTQ young people make up approximately 40% of all young people experiencing homelessness in America. It’s essential that service providers such as shelters, libraries, drop-in centers, and community centers are equipped to meet the unique needs of the LGBTQ young people they serve. Providing LGBTQ youth with inclusive and affirming services often requires a cultural shift at an organization. 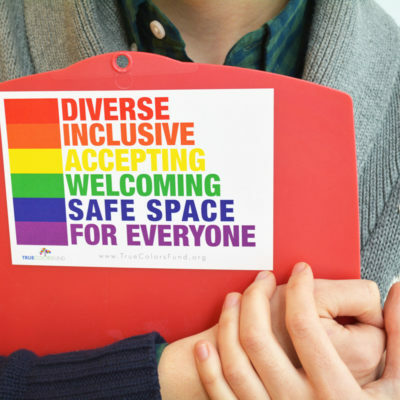 It’s crucial that all staff have a common understanding of LGBTQ inclusivity. From front line workers to facilities staff to administrators, every team member has the ability to make a positive impact on a young person’s life. In order for that to happen, every staff member needs to be prepared to fully support any young person who walks through the door. A True Colors Challenge is an initiative to train a set number of people in a set amount of time to meet this exact goal. It’s a fun, engaging way to get your staff motivated and create change at your organization quickly and efficiently. True Colors Challenges are designed to train individuals within a single organization – or a network of organizations – who work with youth experiencing homelessness to become more culturally aware and affirming of LGBTQ folks in an interactive way. Our online courses provide organizations with simple ways to create inclusive policies and procedures, while providing a baseline for LGBTQ issues and terminology. The best part: our individualized learning experience allows everyone to move at their own pace. By learning together, we’re letting LGBTQ youth know that we’re committed to creating world where all young people can be their true selves. Currently, Challenges take place twice per year: in June for LGBTQ Pride Month and in November for National Runaway Prevention Month. Interested in leading a True Colors Challenge?